The AMSOIL Heavy-Duty By-Pass Filtration System (BMK30) provides superior filtration performance for heavy-duty on- and off-road applications. The BMK30 is designed specifically for the Heavy-Duty Ea By-Pass Filter (EaBP120), bringing Ea synthetic nanofiber technology to the heavy-duty market. Our customers are amazed how simple these actually thus their low price. Advanced nano-fiber media and a high quality mounting kit with high strength hose fittings. Just call and estimate the total feet of hose you need and we'll have your kit on the way! Call 800-579-0580 for best price and ordering! 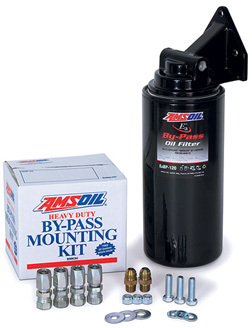 This link takes you to the AMSOIL Bypass Filter Kit section where you can find additional kist for other vehicles - Attach these filters and kits to any vehicle! By-pass oil filtration features a secondary filter with the purpose of eliminating nearly all contaminants in engine oil. By-pass filters have high capacities and eliminate much smaller particles than full-flow filters, including soot. By-pass filters reduce engine wear and increase oil volume, but their high efficiencies mean they also have higher restriction and must be used in conjunction with a full-flow filter. By-pass filters operate by filtering oil on a “partial-flow” basis. They draw approximately 10 percent of the oil pump’s capacity at any one time and trap the extremely small, wear-causing contaminants that full-flow filters can’t remove. Bypass filters have a high pressure differential, causing the oil to flow through them very slowly and allowing for the removal of smaller contaminants. It is called by-pass filtration because the oil flows from the by-pass filter back to the sump and by-passes the engine. This continual process eventually makes all of the oil analytically clean, reduces long-term wear and can dramatically extend drain intervals. be necessary to complete the installation. The installer must also determine the size of the high- and low-pressure ports in order to determine which engine adapters to purchase. Hose is available by the foot from AMSOIL (BP250), and adapter fittings can be purchased from any hydraulics or heavy-duty equipment outlet. The BMK30 is made from high-quality cast aluminum with a steel filter spud that has been thoroughly tested in on-road and severe off road service. The mount is finished with a thick layer of powder-coated paint to provide maximum resistance to the degrading effects of road salt, debris and engine compartment chemicals. BMK30 By-Pass Filtration Systems can be plumbed in series or parallel configurations to provide maximum filtration protection for large V12 and V16 engines. The filter mount features a 3⁄8" NPT connector that connects the outlet and inlet of adjacent filter mounts. For more information on engine adapters or the installation of multiple by-pass systems on one application, contact AMSOIL Technical Services at (715) 399-TECH. Determine the location of a pressurized oil port on the engine. Pressure ports are usually found on the main oil galley or in close proximity to the full-flow filter head assembly. The oil flow from this source should be plumbed into the inlet side of the filter mount. The outlet will be directed to a low-pressure point on the engine, typically a port located at or near the oil pan. Detailed instructions are included with the BMK30 kit. 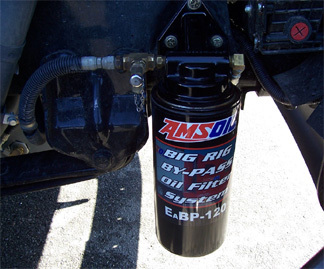 The AMSOIL BMK30 By-Pass Filtration System saves money by enabling the installation of an AMSOIL Ea By-Pass Filter. Its heavy-duty design is ideal for equipment subjected to extreme conditions. 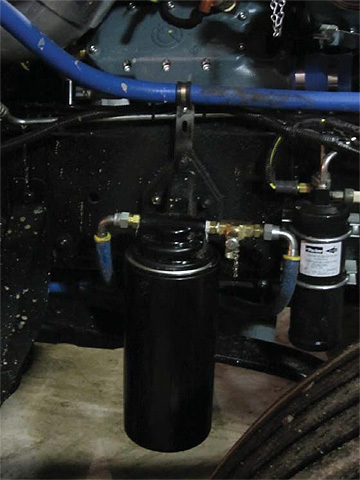 The ability to mount the BMK30 remotely allows the equipment operator to more easily change filters, adding convenience and reducing the amount of time necessary to perform routine maintenance. The EaBP120 features the same synthetic nanofiber media as the rest of the Ea By-Pass Filter family. The EaBP120 removes 98.7% of all contaminants two microns or larger (ISO 4548-12), and provides superior soot-removal efficiency at less than one micron. It comes complete with a marine powder-coated finish for long filter life, even in extreme conditions. The EaBP120 increases the fluid system capacity by approximately one gallon. The additional oil and extended filtration life provide improved oil cooling and ensure that equipment constantly runs on clean oil. Engine efficiency is increased, providing extended engine life. AMSOIL recommends changing the EaBP120 every other full-flow filter change up to 90,000 miles. Extended oil drain intervals should always be accompanied by an oil analysis program. The EaBP120 was designed for heavy-duty applications. Its robust construction and superior filtration performance provide maximum protection over extended drain intervals, reducing downtime, increasing equipment life and saving money.. The AMSOIL BMK30 and EaBP120 provide maximum filtration performance for virtually all heavy-duty diesel applications, including Class 6, 7 and 8 heavy-duty trucks, off-road equipment, buses, generators, marine engines, logging and agricultural equipment. OIL ANALYZERS INC., 715-395-0222, is a division of AMSOIL that provides cost-effective, quality oil analysis services. 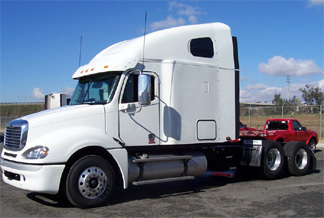 Custom Install for 2011 Freightliner - See below for details. The AMSOIL Heavy-Duty By-Pass System (BMK30) was installed on this 2011 Freightliner Classic. It features a custom-built 2003 Series 60 Detroit Diesel 12.7L engine that makes 500 hp. It is a Glider Kit, which is essentially a new truck with a remanufactured engine, transmission and rear ends. A 1/4-inch bracket was bolted to the frame using existing holes to avoid drilling new holes. We located the bracket as close to the engine as possible to minimize the amount of hose required. The oil supply line taps into the oil filter housing, which has several oil galley plugs for that purpose. The oil return line attaches to a galley plug in the oil pan, where most engine manufacturers include galley plugs. The entire installation took about 90 minutes and used aftermarket hoses and fittings throughout. The truck uses 12 gallons of AMSOIL Premium Protection 20W-50 Synthetic Motor Oil (it is not equipped with EGR or a DPF). AME 10W40 is suggested) We also installed a Sample Valve Kit (BK30) for drawing oil samples for oil analysis.